The Peralta House as seen from 34th Avenue. One of the many places that tell a story of Oakland’s origin can be found in the heart of the Fruitvale District. The Peralta House once sat in the middle of a 44,800-acre ranch, granted to the Peralta family by the last Spanish governor, Don Pablo Vicente de Solá, in 1820. Today, the Peralta Hacienda Historical Park is a mere six-acres, but it includes the historic adobe structures built in 1820 and 1840, the Peralta House, and Peralta Creek, which is planted with native California flora. And the park serves some of the most vulnerable communities in Oakland: day laborers, immigrants who do not speak English, and students of color who attend Oakland public schools. It’s the site of an annual Cambodian New Year celebration, the Welcome to Wildlife and A.C.E Summer Camps, the Latino Culture Festival, and a destination for school field trips. Despite this rich history and multitude of uses, the park has struggled financially. Currently, Peralta Hacienda receives $45,000 a year from the city, but the funds are by no means enough to cover administrative costs. The park also receives funding from the National Endowment for the Humanities. But these are dollars that the Trump administration wants to eliminate. The park’s staff and volunteers have scrambled to find new resources. At the same time, in March of this year, Peralta Hacienda was one of the winners of the 2017 National Medal Award, the country’s highest honor given to museums and libraries for community service. As the Fruitvale has changed and new communities have moved to the neighborhood, the park has evolved its programming to serve them. 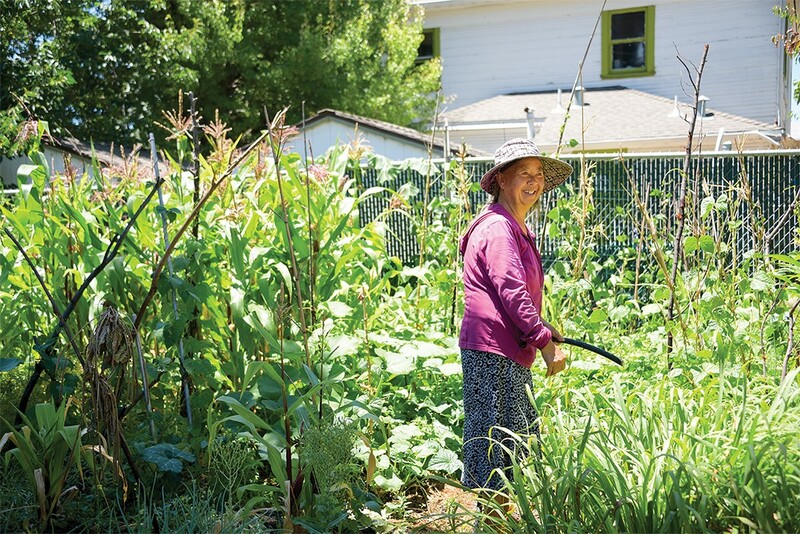 For example, in 2003, Peralta Hacienda partnered with the Lao Family Center to create what is now called Mien Garden, a space around the Peralta home where Laotian Mien women cultivate more than thirty vegetable species native to Laos. As the Mien women began cleaning the area and planting seeds, folktales were exchanged among the elders and the staff. What started off as a community garden, turned into a storytelling project that documented Mien elders recounting stories of escaping war and the hardships of immigration. The elders also reflected on the idea of calling Oakland home, and the importance of retaining their culture in a new place. Mey Yan Saechao, one of the Mien gardeners. Inside the Peralta House, permanent exhibits trace the story of the land from the Ohlone people who inhabited the region long before the arrival of Europeans, to the arrival of the Peraltas. In 1848, the land was claimed by the United States under the Treaty of Guadalupe Hidalgo. By 1879, the Peraltas were left with only 23 acres of land as American squatters stole or purchased their holdings. Currently on display in the museum’s exhibit area is Stories of Incarceration, a collection of tales told by prisoners and their family members. Later this year, Stories of Day Laborers, an exhibit that will expose visitors to the lives of immigrants who come to the United States to work in some of the most grueling industries. Holly Alonso, the executive director of the Peralta Hacienda, told the Express that she hopes to receive enough funding to develop the empty land surrounding the current museum into an outdoor space with permanent exhibits. The Peralta Creek nature area is also in desperate need of help. Homeless people often take residence in the shaded areas under the oak and buckeye trees, inadvertently damaging the stream banks and foliage. Illegal dumping is a constant problem, too. In the summer, however, the area gets revived, thanks to the kids who sign up for the summer camps and volunteer work. Alonso hopes that the creek area can be fenced in so it can be enjoyed by visitors year-round, but protected from illegal dumping. The Peralta Hacienda has been able to go on thanks to private contributions. So far, they have raised more than $690,000 to develop the land surrounding the farmhouse, but an additional $171,000 is still needed to ensure that the project of developing the outdoor area becomes a reality. Councilmember Noel Gallo has promised to fulfill this need by finding money in the city’s budget. Alonso said it is imperative to preserve historical landmarks like Peralta Hacienda and expand the vital role they play as community centers. “It’s about Fruitvale, about Oakland, but also about the backdrop of history that we’re living in,” she said. 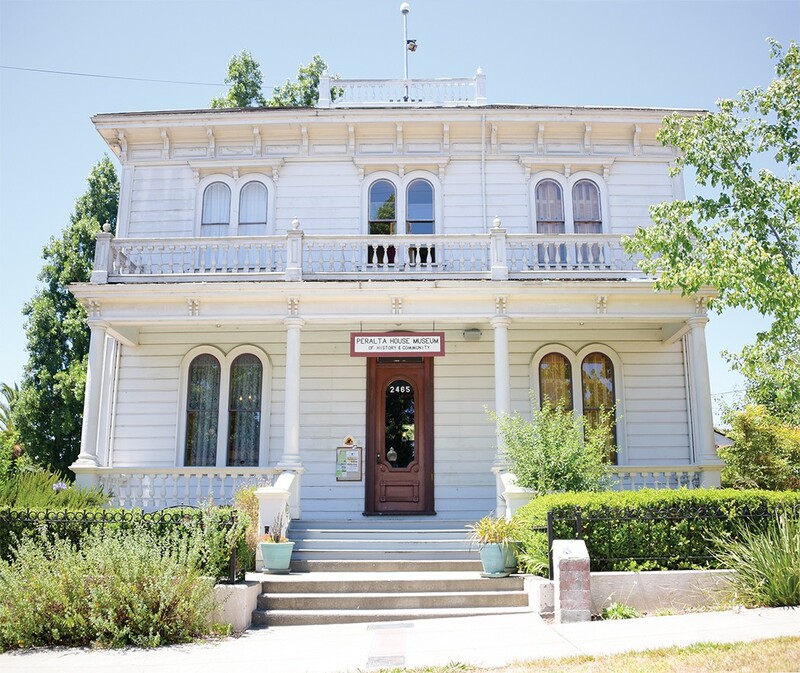 Peralta Hacienda De-Colonized: Fruitvale Latino American Culture Festival on August 19, 12pm-4pm, 2465 34th Ave, Oakland . The event features Latino food, social dancing, kid’s activities, and a car show, and dedicates a special art installation that symbolizes the California landscape.